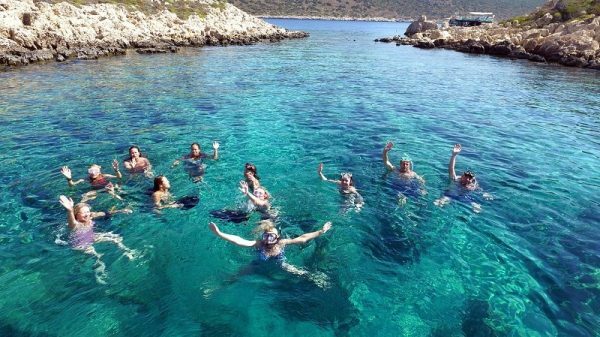 Participate in an exciting and memorable boat trip during your vacations in Side / Turkey and get lucky enough to see dolphins. 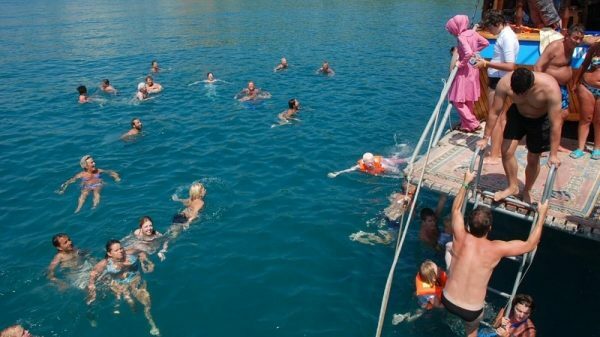 Side Dolphin Island Boat Trip invites you to relax under the sun, to explore some picturesque beaches and enjoy your day at the maximum. The boat trip experience ensures some real fun with foam party and other entraining activities. 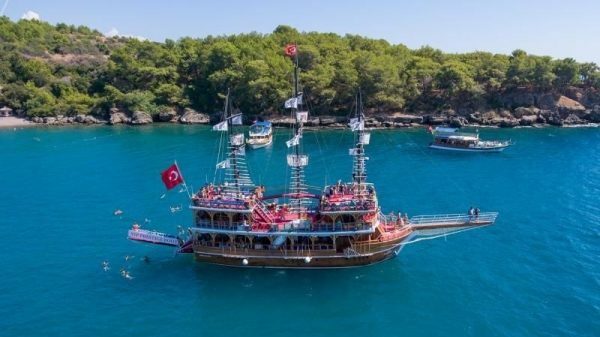 Side Dolphin Island Boat Trip is an ideal option for all, as it combines fun, excitement, relaxation and many natural beauties. 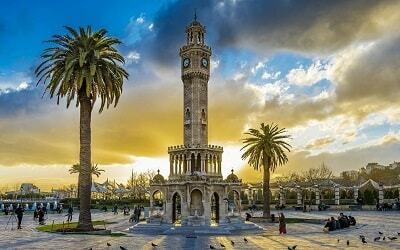 During the morning, our vehicles will pick you up from your hotel and drive you towards Kumköy beach. This location is 7Km from Side and is the departure point of the boat. Once the boat trip starts, our professional and experienced guide will provide some important information about the spots that you are going to visit. 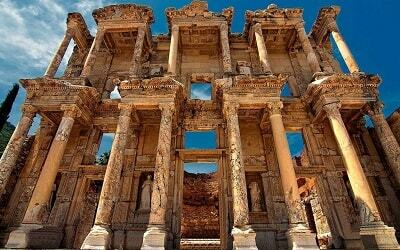 During the boat trip you will have the chance to admire some of Side’s sights. 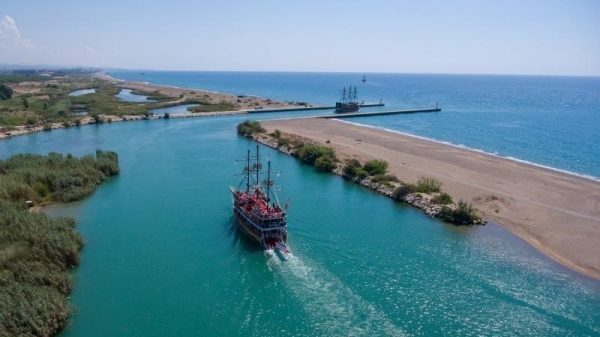 You will be passing towards Manavgat River, the ancient Side port and the Temple of Apollo. A short swimming break follows at the mouth of the river. An interesting highlight is that you have to option to swim either in the river side or in the sea. The spot is of unique beauty as the cold river waters are combined with the warm waters of the Mediterranean Sea. By the end of the break, a tasty lunch will be served aboard. The menu includes barbecued chicken or fish, rice, salad and bread. The boat will then continue towards Dolphin Island, where you will admire the natural beauty of this spot. In addition, you will have the opportunity to swim in crystal clear waters and experience from first-hand the beauty of this spot. When the swimming break at Dolphin Island ends, the boat continues on its way back. 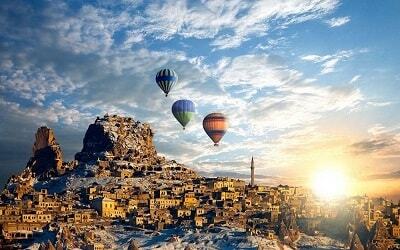 The return will be another memorable experience in your excursion. There will be a foam party in the boat with some upbeat music. In addition, professional dancers will perform an amazing dance show. 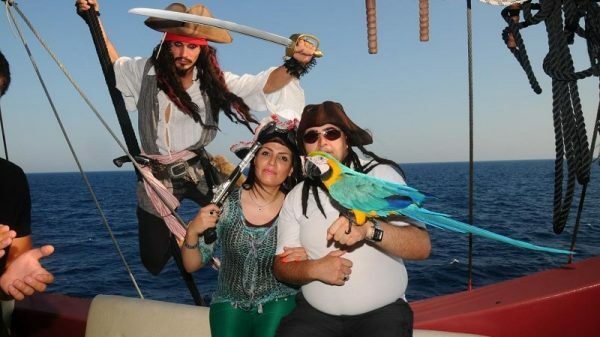 Alternatively, if you are seeking for some more relaxation you can always enjoy the sun on the boat’s deck. 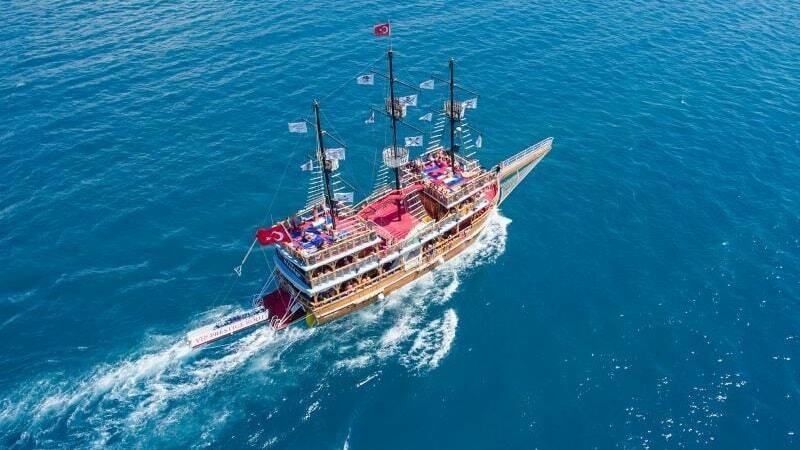 The excursion finishes once the boat reach Kumköy pier. There, our vehicles will drive you back towards your hotel. By the end of Side Dolphin Island Boat Trip you will be full of great memories. If you are lucky enough you may end up with some amazing dolphin pictures as souvenirs from your exciting excursion! If you are lucky enough, you can see dolphins swimming next to the boat! If you are looking for a quiet day, Side Blue Lagoon Boat Trip is the perfect choice. 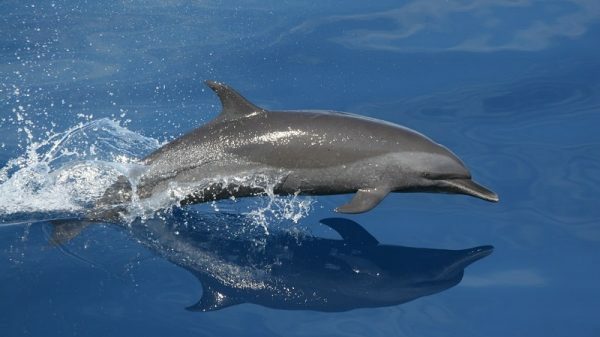 Participate in Side Dolphin Island Boat Trip and fill you day with excitement and unique experiences! 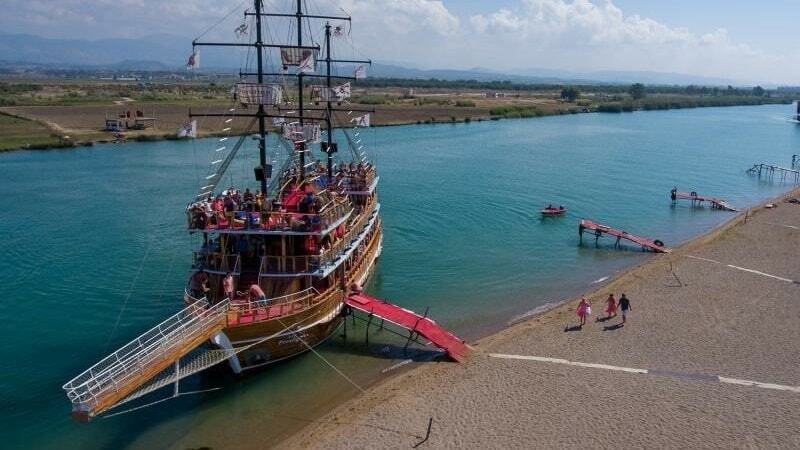 Enjoy a boat trip with a Pirate boat and swim in some picturesque spots. 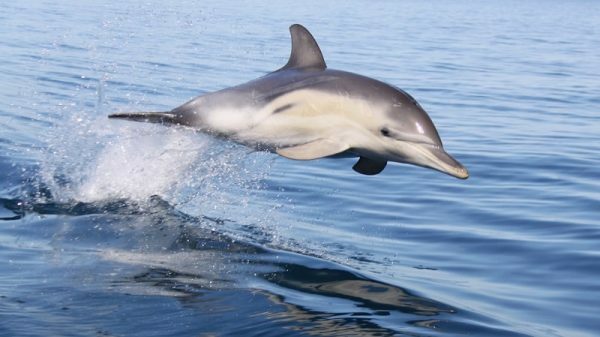 This excursion might be a great memory as you may have the opportunity to see dolphins during your trip. Foam party, dance shows, swimming and sunbathing is what you should expect from this trip. Side Dolphin Island Boat Trip starts in the morning when our comfortable vehicles will pick you up from your hotel. 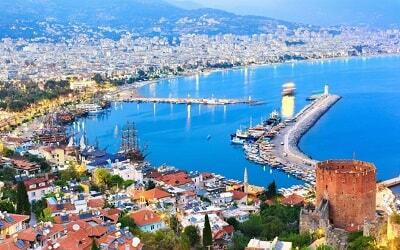 After a 7Km drive, you will reach the pier at Kumköy beach, which is the departure point of the boat. During this boat trip you will have three different swim stops. For this excursion you will be traveling with an amazing boat that has a unique pirates’ style. The boat is spacious is enough to make you enjoy every moment of this excursion. It has 3 floors, toilets, showers and a special cabin for baby care. In addition, there are sunbeds on the upper deck and seating places under the shade. The boat has also a bar. During the boat trip you will be passing towards Manavgat River, the ancient Side port and the Temple of Apollo. At the mouth of the river there will be a short swimming break. The point is of unique natural beauty as you will have the chance to swim either in the river side or in the sea. Right after the swimming break, a tasty and freshly made lunch will be served on the boat. The lunch includes barbecued chicken or fish, rice, salad and bread. 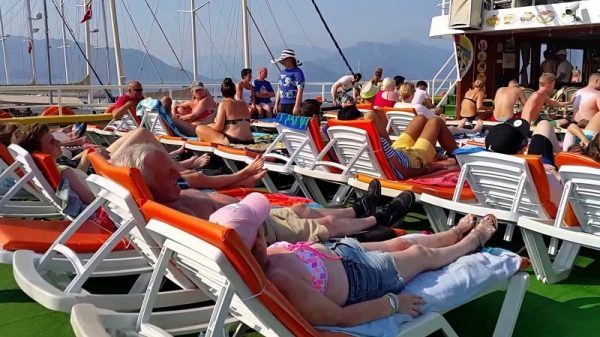 Take a chance to relax after the break and enjoy the sun on the upper deck as the boat continues towards the next stop. The next stop of your excursion will be made at Dolphin Island. This particular spot can be characterized as a natural wonder due to its unique beauty. Take advantage of the break and swim in crystal clear waters to refresh yourself. If this is your lucky day you might have the chance to see dolphins swimming next to the boat. It will be a one of a kind experience to see the famous ‘bottlenose dolphins’. However, there is no guarantee that these intelligent and cute animals will get close to the boat. If you are participating in this amazing excursion with your family, there is nothing to worry about. This spacious boat is kids friendly. The professional staff will be taking care of your kids while you are relaxing on the boat. 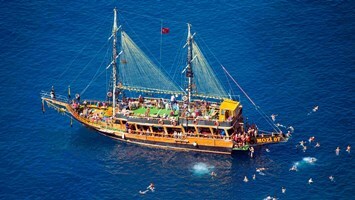 In addition, during the return trip a foam party with great music will take place in the boat. Dancers will also be performing dance show. Side Dolphin Island Boat Trip ends by the time the boat reach Kumköy beach. There comfortable vehicles will be waiting for you in order to drive you back at your hotel. 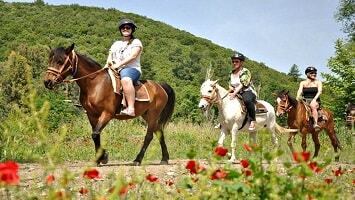 This excursion will be a long-lasting memory from your holidays in Side.